825-414600 Features: -Adjustable dust deflector and dust chute. -Completely enclosed drums and a guarded sanding belt. -Fine thread adjustment for simple and easy belt tracking. -Plain and compound miters are easily obtained by using the standard die-cast aluminum miter gauge. Product Type: -Tool Grinders. Generic Specifications: -Power Cap. : 1 1/2 hp. -Voltage: 115.00 V. Dimensions: Overall Height – Top to Bottom: -57.5 Inches. Overall Width – Side to Side: -19 Inches. Overall Depth – Front to Back: -25.5 Inches. Overall Product Weight: -290 Pounds. 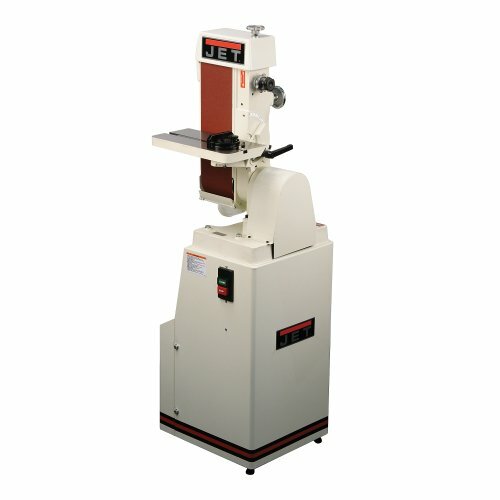 Buy JET J-4300A 6-Inch by 48-Inch Single Phase Industrial Belt Machine at Discounted Prices ✓ FREE DELIVERY possible on eligible purchases. 825-414600 Features: -Adjustable dust deflector and dust chute. -Completely enclosed drums and a guarded sanding belt. -Fine thread adjustment for simple and easy belt tracking. -Plain and compound miters are easily obtained by using the standard die-cast aluminum miter gauge. Product Type: -Tool Grinders. Generic Specifications: -Power Cap. : 1 1/2 hp. -Voltage: 115.00 V. Dimensions: Overall Height - Top to Bottom: -57.5 Inches. Overall Width - Side to Side: -19 Inches. Overall Depth - Front to Back: -25.5 Inches. Overall Product Weight: -290 Pounds.